Did you know that every year, thousands of construction workers develop heat-related illness on the job, and some even die? If you, or your team members, work outside performing various commercial/residential building and construction activities, and you don’t follow basic precautionary measures, you could be at risk for heat exposure. According to a news article, one 41-year-old Illinois construction worker died after working four hours re-roofing an apartment complex in Urbana in 2014. Temperatures that day reached 90 degrees Fahrenheit, with a heat index of more than 100 degrees. The crew, according to the article, was working in full sunlight, which increased the effective temperature to approximately 105 degrees. During their lunch break, crew members said they noticed that the worker was showing signs of altered speech that he became increasingly disoriented and exhibited irregular motor control. His crew transported him to a nearby hospital where he died of complications from heat stroke. Unfortunately, his employer did not have an adequate heat illness prevention program, nor did the company ensure that its workers were getting enough water, rest and shade. This type of heat-related death is preventable. In response, the Occupational Safety and Health Administration (OSHA), in partnership with the National Oceanic and Atmospheric Administration and the National Weather Service, initiated a nationwide awareness campaign back in 2011 to teach U.S. workers and employers about the dangers of working in hot weather and to provide valuable resources to address these concerns. Today’s employers have an important responsibility – and legal obligation – to provide safe working conditions. First and foremost, it’s vital to train your workers on how to recognize heat illness, how to prevent it and what to do if someone gets sick. Also, encourage workers to watch each other for signs of heat illness. Have a plan for incorporating heat illness prevention into worksite activities during hot weather. Make sure that your workers have adequate drinking water. Remind them to drink small amounts of water often, before they actually become thirsty. Experts say a good rule of thumb is to drink four cups of water every hour. Allow your workers to take frequent breaks in cool, shaded areas. Take steps that help your workers become acclimated to the heat, especially those team members who are new to working outdoors in the heat, or who have been away from work for a week. If your workers are doing strenuous work, or wearing layers of protective clothing, ALWAYS take extra precautions. For example, schedule heavy tasks earlier in the day, and develop and enforce work/rest schedules. Other ways workers can prevent heat illness include wearing light-colored cotton clothing; using sunscreen to prevent sunburn; and, avoiding drinks with caffeine or alcohol. Finally, it’s smart to be prepared for medical emergencies. Ensure that medical services are available, and for those workers who show symptoms of heat illness, get immediate care by calling 911. 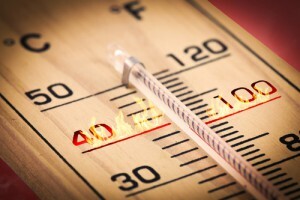 What Are the Signs and Symptoms of Heat Illness? Considered a medical emergency, heat stroke is the most serious of all heat-related illnesses. The symptoms include heavy sweating or red, hot, dry skin; high body temperature; confusion; loss of consciousness; and/or convulsions. Always call 911 if a worker shows any signs of heat stroke. Heat exhaustion is the next most-serious heat illness. Symptoms can include nausea, headache, sweaty skin, cramps, fast heartbeat, dizziness and weakness. And finally, heat fatigue, heat cramps and heat rash are less serious issues, but they are still considered symptoms of heat exposure. OSHA’s Heat Safety Tool provides workers and supervisors with vital safety information whenever and wherever they are – right on their mobile Android or iPhone. The app allows workers and supervisors to calculate the heat index for their worksite, and, based on the heat index, displays a risk level to outdoor workers. Then, a simple click provides reminders about the protective measures that should be taken at that risk level to protect workers from heat-related illness – reminders about drinking enough fluids, scheduling rest breaks, planning for and knowing what to do in an emergency, adjusting work operations, training on heat illness signs and symptoms, and monitoring each other for signs and symptoms of heat-related illness. The app is available at www.osha.gov/heat. For more information about construction or SPF-related safety issues, visit www.intechequipment.com. Intech Equipment and Supply is a leading full service spray polyurethane foam equipment and related parts supplier.